Hudson was born in the borough of Quilmes, now Florencio Varela of the greater Buenos Aires, in Buenos Aires Province, Argentina. He was the son of Daniel Hudson and his wife Catherine née Kemble, United States settlers of English and Irish origin. He spent his youth studying the local flora and fauna and observing both natural and human dramas on what was then a lawless frontier, publishing his ornithological work in Proceedings of the Royal Zoological Society, initially in an English mingled with Spanish idioms. He had a special love of Patagonia. Hudson settled in England during 1874, taking up residence at St Luke's Road in Bayswater. He produced a series of ornithological studies, including Argentine Ornithology (1888–1899) and British Birds (1895), and later achieved fame with his books on the English countryside, including Hampshire Day (1903), Afoot in England (1909) and A Shepherd's Life (1910), which helped foster the back-to-nature movement of the 1920s and 1930s. It was set in Wiltshire and inspired a later book The Shepherd's Life about a Lake District farmer which was published in 2015. He was a founding member of the Royal Society for the Protection of Birds. Hudson's best known novel is Green Mansions (1904), and his best known non-fiction is Far Away and Long Ago (1918), which was made into a film. Ernest Hemingway famously referred to Hudson's book The Purple Land (1885) in his novel The Sun Also Rises and also referred to Hudson's Far Away and Long Ago in his posthumous novel The Garden of Eden (1986). 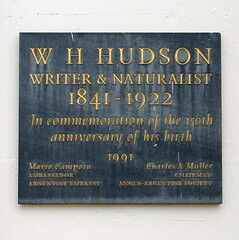 In Argentina, Hudson is considered to belong to the national literature as Guillermo Enrique Hudson, the Spanish version of his name. A town in Berazategui Partido and several other public places and institutions are named after him. 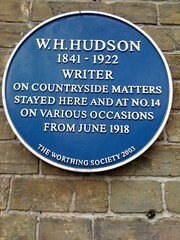 Towards the end of his life, Hudson moved to Worthing in Sussex, England. His grave is in Broadwater and Worthing Cemetery in Worthing.